A woman who had been trapped for several hours was pulled from the rubble by rescuers Monday night after a building collapsed onto two others in Poughkeepsie. Rotanya Hargrove was alert and conscious when she was rescued at about 8 p.m., nearly four hours after a vacant, seven-story building collapsed onto two other buildings during a severe thunderstorm with gusty winds. Hargrove, 43, suffered non-life threatening injuries. During the collapse, the larger building at 19 Academy St., fell onto another building at 17 Academy St., and then onto a smaller three-story building at 15 Academy St., causing it to collapse as well, Det. Sgt. Sean Fitzgerald. A video of the rescue can be viewed here. All of downtown Poughkeepsie has been closed to traffic as a search-and-rescue operation is underway after a vacant building collapsed onto two other buildings late Monday afternoon, trapping at least one person, according to the City of Poughkeepsie Fire Department. The buildings, located at the corner of Academy and Cannon streets, collapsed around 4:15 p.m. Monday shortly after a severe thunderstorm passed through. Many roads in downtown Poughkeepsie are closed as a result. An unidentified woman is reportedly trapped. 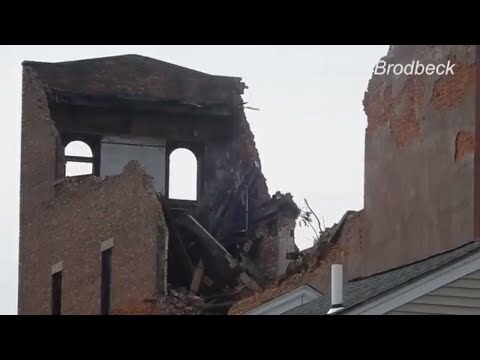 During the collapse, the larger building, a vacant seven-story structure at 19 Academy St., fell onto another building at 17 Academy St., and then onto a smaller three-story building at 15 Academy St., causing it to collapse as well, Det. Sgt. Sean Fitzgerald.